Granger Volleyball lost both matches on Saturday, November 10th at the State Tournament in the Yakima SunDome placing 4th in State. Granger lost to Lynden Christian, the eventual champion, 3-0 (25-14, 25-14, 25-16) and King’s 3-1 (22-25, 25-19, 25-16, 25-22). Lily Stewart had 34 kills and 17 digs, Delilah Schneider had 17 kills, and Galilea Birrueta had 7 kills and 6 blocks on the day. Highlights: Lily Stewart 34 kills, 17 digs; Delilah Schneider 17 kills; Galilea Birrueta 7 kills, 7 digs, 6 blocks; Isamar Solorio 23 digs, 19 perfect passes; Naya Roettger 46 assists, 11 digs; Nizhoni Tallman 18 digs; Tori Zapien 7 digs, 3 blocks; Shaylin Cardenas 9 digs. Spartan Volleyball won both matches on Friday, November 9th at the State Tournament in the Yakima SunDome placing them in Saturday’s Semifinal match. 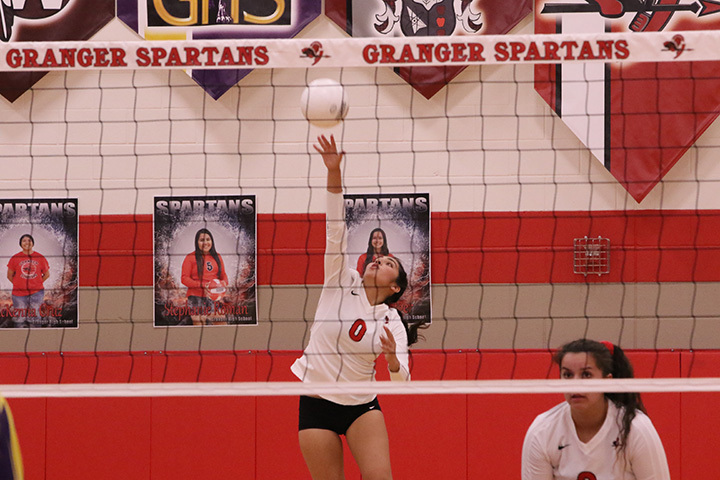 Granger defeated King’s Way Christian 3-1 (23-25, 25-22, 25-14, 26-24) and Overlake 3-0 (25-17, 25-11, 25-15). 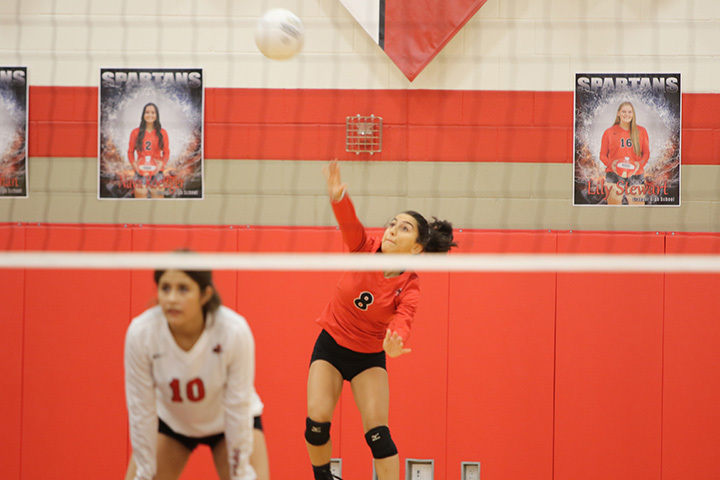 Lily Stewart led the Spartans with 55 kills and 23 digs, Nizhoni Tallman and Isamar Solorio both had 24 digs, and Naya Roettger had 14 kills and 71 assists. 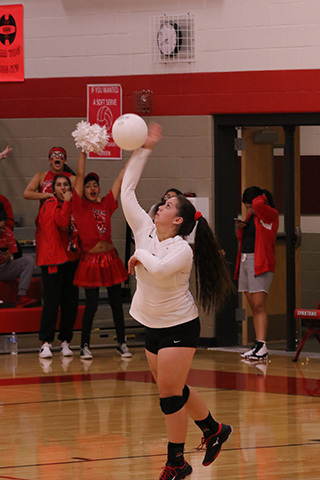 Highlights: Lily Stewart 55 kills, 23 digs, 19 perfect passes; Delilah Schneider 12 kills; Galilea Birrueta 3 kills, 4 perfect passes; Isamar Solorio 24 digs, 24 perfect passes; Naya Roettger 71 assists, 21 digs, 14 kills; Nizhoni Tallman 24 digs, 28 perfect passes, 3 aces; Shaylin Cardenas 15 perfect passes, 19 digs. Spartan Volleyball swept through the District Tournament at Connell on Saturday, November 3rd. Granger defeated Ki-Be 3-0 (25-15, 25-17, 25-22) and La Salle 3-1 (25-21, 17-25, 25-14, 25-23) Lily Stewart had 37 kills, 23 digs, 3 aces, 4 blocks and 14 perfect passes and Naya Roettger had 55 assists, 18 digs, 28-28 serving, 5 kills for the day. Highlights: Delilah Schneider 13 kills; Galilea Birrueta 10 kills, 4 blocks, 5-5 serving, 9 perfect passes; Isamar Solorio 17-17 serving, 25 digs, 18 perfect passes; Lily Stewart 3 aces, 27 kills, 4 blocks, 23 digs, 14 perfect passes; Naya Roettger 28-28 serving 5 kills, 55 assists, 18 digs; Nizhoni Tallman 27-27 serving, 3 aces, 27 digs, 46 perfect passes; Tori Zapien 3 kills, 1 block, 7 digs; Lenikiah Santacruz 15-15 serving, 17 digs; Shaylin Cardenas 19-19 serving, 6 digs. 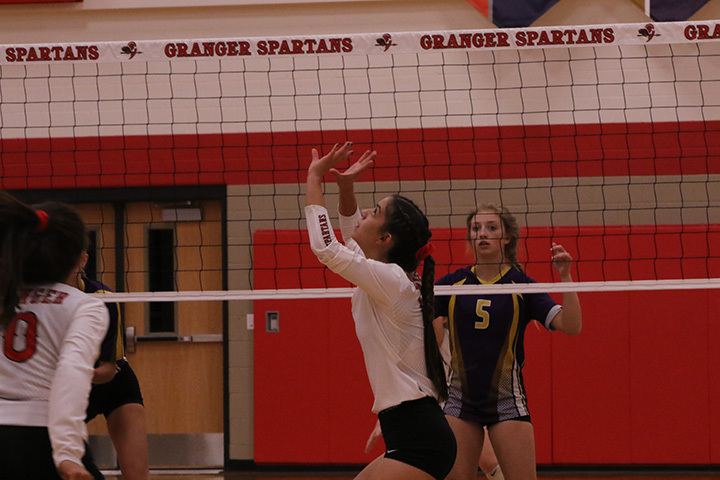 Granger Spartan Volleyball won at home the opening game of District vs College Place 3-0 (25-11, 25-16, 25-12). Nizhoni Tallman had 22 perfect passes & 14 digs, Naya Roettger had 28 assists & 8 digs; and Delilah Schneider had 10 kills, 4 aces & 1 block. Highlights: Delilah Schneider 10 kills, 4 aces, 1 block; Galilea Birrueta 4 kills, 2 blocks; Isamar Solorio 9 digs, 12 perfect passes; Lily Stewart 18 kills; Naya Roettger 28 assists, 8 digs; Nizhoni Tallman 14 digs, 22 perfect passes; Tori Zapien 3 kills, 1 block; Hailey Golob 2 aces; Shaylin Cardenas 5 perfect passes. 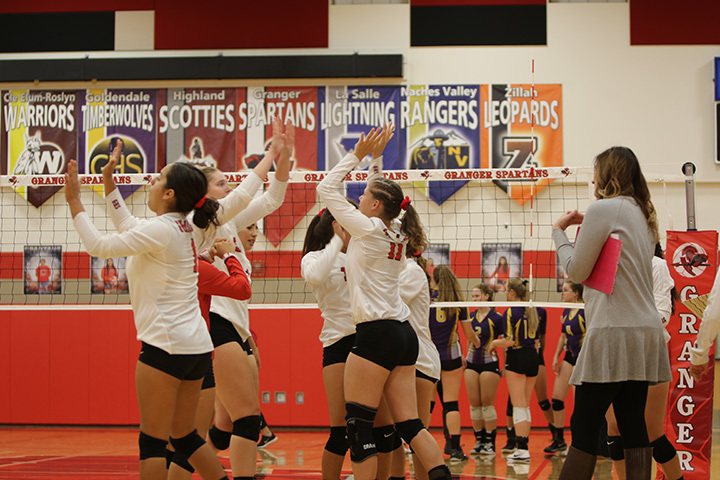 Spartan Volleyball defeated La Salle 3-1 (25-19, 27-29, 25-13, 25-19) at home on Thursday, October 18th. Lily Stewart had 24 kills, 2 aces, 7 digs & 2 blocks; Delilah Schneider added 7 kills, 7 digs & 2 aces; Isamar Solorio was 9-9 serving, had 4 kills, 19 digs & 15 perfect passes; and Nizhoni Tallman was 22-22 serving with 24 digs & 21 perfect passes. Granger ties La Salle for 1st in the SCAC West. Highlights: Delilsh Schneider 7 kills, 7 digs, 2 aces; Galilea 3 kills, 2 blocks, 4 perfect passes; Isamar Solorio 9-9 serving, 4 kills, 19 digs, 15 perfect passes; Lily Stewart 24 kills, 2 aces, 7 digs, 2 blocks; Naya Roettger 19-19 serving, 4 aces, 10 digs, 25 assists; Nizhoni Tallman 22-22 serving, 24 digs, 21 perfect passes; Shaylin Cardenas 12 digs, 7 perfect passes, 3 aces; Tori Zapien 2 kills, 1 block. Granger Spartan Volleyball 3, Naches Valley 0 (25-19, 25-20, 25-22) on the road on Tuesday, October 16th. Lily Stewart had 31 kills and 9 digs, Nizhoni Tallman was 10-10 serving with 27 digs and 14 perfect passes; and Shaylin Cardenas was 17-17 serving with 14 digs. Highlights: Delilah Schneider 5 kills, 4 digs; Galilea Birrueta 4 kills, 6 digs, 6 perfect passes; Isamar Solorio 6-6 serving 15 digs, 10 perfect passes; Lily Stewart 31 kills, 7 digs, 9 perfect passes; Naya Roettger 11-11 serving, 4 kills, 8 digs, 33 assists; Nizhoni Tallman 10-10 serving, 27 digs, 14 perfect passes; Shaylin Cardenas 17-17 serving, 14 digs. Spartan Volleyball won 3-0 (25-7, 25-6, 25-10) vs Highland at home on Thursday, October 11th. Lenikiah Santacruz was 19-19 serving with 3 aces and Galilea Birrueta had 6 kills and 1 block. Highlights: Delilah Schneider 6 kills; Galilea Birrueta 6 kills, 1 block; Isamar Solorio 6-6 serving, 7 perfect passes; Lily Stewart 7 kills, 1 block; Naya Roettger 12-12 serving, 4 kills, 10 assists; Tori Zapien 4 kills, 1 block; Hailey Golob 2 aces, 6 perfect passes; Lenikiah Santacruz 19-19 serving, 3 aces. 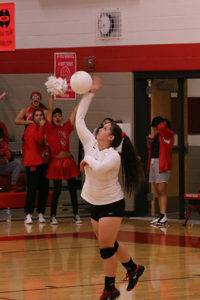 Granger Spartan Volleyball won 3-0 (25-9, 26-24, 18-25, 25-20) at Prosser on Tuesday, October 9th. Naya Roettger had 44 assists, 14 digs and was 17-17 serving; Lily Stewart had 22 kills, 6 digs, 8 perfect passes and was 11-11 serving, and Delilah Schneider had 14 kills. Highlights: Delilah Schneider 14 kills, Galilea Birrueta 9 kills, 5 digs, 8 perfect passes; Isamar Solorio 4 kills, 21 digs, 15 perfect passes; Lily Stewart 11-11 serving, 22 kills, 6 digs, 9 perfect passes; Naya Roettger 17-17 serving, 14 digs, 44 assists; Nizhoni Tallman 11 digs, 18 perfect passes, 13-13 serving; Tori Zapien 7 digs; Lenikiah Santacruz 7-7 serving, 8 digs. Spartan Volleyball defeated Goldendale on the Road 3-0 (25-10, 25-19, 25-23) on Monday, October 8th. Lily Stewart had 16 kills, 2 aces and 10 digs, and Delilah Schneider had 8 kills and 2 aces. Highlights: Delilah Schneider 8 kills, 2 aces; Galilea Birrueta 3 kills; Isamar Solorio 7-7 serving, 8 digs; Lily Stewart 16 kills, 2 aces, 10 digs; Naya Roettger 23 assists, 12 digs 8-8 serving; Nizhoni Tallman 6-6 serving, 7 digs; Lenikah Santacruz 3 aces, 9 digs. Granger Volleyball beat Zillah at home 3-0 (26-24, 25-14, 25-21) on Thursday, October 4th. Lily Stewart had 25 kills and a block, Nizhoni Tallman had 18 digs and 24 perfect passes, and Isamar Solorio had 10 digs and 15 perfect passes. Highlights: Delilah Schneider 6 kills, 1 block; Galilea Birrueta 2 kills, 3 blocks, 5 perfect passes; Isamar Solorio 10 digs, 15 perfect passes; Lily Stewart 25 kills, 6 digs, 1 block; Naya Roettger 15-15 serving, 28 assists, 8 digs; Nizhoni Tallman 18 digs, 24 perfect passes; Lenikah Santacruz 13 digs, 7 perfect passes; Tori Zapien 5 digs. Spartan Volleyball won the Bronze Bracket at the Linda Sheridan Classic Volleyball Tournament in Spokane on Saturday, September 29th. In pool play Granger lost to Mountain View 2-1 (21-25, 25-19, 10-15), Lewis & Clark 2-1 (20-25, 25-23, 16-17), and Cheney 2-0 (23-25, 19-25). Granger won all matches in bracket play to Mt. Spokane JV 2-1 (18-25, 25-12, 15-9), Clarkston 2-1 (23-25, 25-23, 15-13), North Central 2-0 (25-16, 25-10), and Timberlake 2-0 (25-20, 25-17). Highlights: Delilah Schneider 30 kills, 3 blocks, 14 digs, 16 perfect passes; Galilea Birrueta 11 kills, 3 blocks, 18 perfect passes; Isamar Solorio 35-35 serving, 13 kills, 52 digs, 53 perfect passes; Lily Stewart 89 kills, 4 blocks, 46 digs, 36 perfect passes; Naya Roettger 60-64 serving, 108 assists, 53 digs; Nizhoni Tallman 65 digs, 105 perfect passes; Tori Zapien 4 kills, 6 digs; Lenikah Santacruz 7 aces, 32 digs, 31 perfect passes. Granger Volleyball 3, Cle Elum 0 (25-11, 25-13, 25-14) at home on Thursday, September 27th. Naya Roettger had 26 assists, Isamar Solorio had 4 kills and 5 perfect passes, and Lily Stewart had 15 kills. Highlights: Delilah Schneider 5 kills; Galilea Birrueta 6 kills, Isamar Solorio 4 kills, 5 perfect passes; Lily Stewart 15 kills; Naya Roettger 26 assists; Nizhoni Tallman 25 perfect passes; Tori Zapien 2 kills. Spartan Volleyball lost 3-1 (15-25, 15-25, 25-19, 22-25) at LaSalle on Tuesday, September 25th. Granger was led by Naya Roettger with 20 assists, 20 digs, 3 kills, & 1 block. Highlights: Delilah Schneider 8 kills, 2 digs; Galilea Birrueta 3 kills; Isamar Solorio 5 digs; Lily Stewart 15 kills, 2 aces, 19 digs, 2 blocks; Naya Roettger 20 assists, 20 digs, 3 kills, 1 block; Nizhoni Tallman 5 digs, 2 assists, 1 ace; Lenikiah Santacruz 8 digs. Spartan Volleyball 3, Naches Valley 0 (26-24, 25-15, 25-15) at home on Thursday, September 20th. Lily Stewart had 20 kills, Nizhoni Tallman was 12-12 serving, had 22 digs, and 25 perfect passes, and Lenikah Santacruz was 12-12 serving with 15 digs in her varsity debut. Highlights: Delilah Schneider 8 kills, 3 aces; Gali Birrueta 5 kills, 2 blocks; Isamar Solorio 13 digs, 10 perfect passes; Lily Stewart 20 kills, 8 digs, 8 perfect passes; Naya Roetter 10-10 serving, 26 assists; Nishoni Tallman 12-12 serving, 22 digs, 25 perfect passes; Lenikah Santacruz 12-12 serving, 15 digs. Granger Spartan Volleyball defeated Highland on the road 3-0 (25-5, 25-7, 25-6) on Tuesday, September 18th. Nizhoni Tallman was 20-20 serving with 10 aces and 15 perfect passes, Lily Stewart was 8-8 serving with 10 kills, and Gali Birrueta had 7 kills. Highlights: Delilah Schneider 6 kills; Gali Birrueta 7 kills; Kaitlyn Roettger 10-10 serving, 8 digs, 10 perfect passes; Lily Stewart 8-8 serving, 10 kills; Naya Roettger 24 assists; Nizhoni Tallman 20-20 serving, 10 aces, 15 perfect passes. Granger Volleyball competed at the SunDome Volleyball Festival placing 2nd overall on Friday, September 14th. Granger defeated Providence Classical Christin 25-15, 25-6; Royal 25-13, 25-7; and Onalaska 25-9, 25-8. Then in the 1st place bracket play defeated Meridian 25-17, 25-16; La Salle 25-21, 27-25; and lost to Oaksdale in the Championship 23-25, 21-25. Lily Stewart led with 59 kills and 4 blocks, Delilah Schneifer had 25 kills and 3 blocks, and Nizhoni Tallman had 38 digs and 60 perfect passes. Highlights: Delilah Schneider 25 kills, 3 blocks; Gali Birrueta 7 kills, 8 perfect passes; Isamar Solorio 49-49 serving, 24 kills 20 perfect passes; Kaitlyn Roettger 9 kills, 35 digs, 41 perfect passes; Lily Stewart 59 kills, 17 digs, 4 blocks; Naya Roettger 49-51 serving, 95 assists, 23 digs; Nizhoni Tallman 38 digs, 60 perfect passes. Spartan Volleyball 3, Goldendale 0 (25-22, 25-15, 25-20) in Granger on Thursday, September 13th. Lily Stewart had 26 kills, Naya Roettger had 32 assists and 11 digs, and Nizhoni Tallman was 8-8 serving with 16 digs and 18 perfect passes. Highlights: Delilah Schneider 4 kills; Gali Birrueta 4 kills, 2 blocks; Isamar Solorio 12-12 serving, 7 digs, 7 perfect passes; Kaitlyn Roettger 12-12 serving, 10 digs, 8 perfect passes; Lily Stewart 26 kills, 8 digs, 9 perfect passes; Naya Roettger 32 assists, 11 digs; Nizhoni Tallman 8-8 serving, 16 digs, 18 perfect passes. 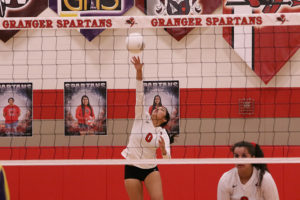 Granger Spartan Volleyball won on the road 3-1 (26-28, 25-9, 25-22, 25-12) vs Zillah on Tuesday, September 11th. Kaitlyn Roettger was 20-20 serving, had 7 kills, 14 digs and 13 perfect passes; and Lily Stewart had 25 kills. Highlights: Delilah Schneider 5 kills; Gali Birrueta 5 kills, 2 blocks; Isamar Solorio 14-14 serving, 13 perfect passes, 17 digs; Kaitlyn Roettger 20-20 serving, 7 kills, 14 digs, 13 perfect passes; Lily Stewart 25 kills, 12 perfect passes; Naya Roettger 34 assists, 2o digs; Nizhoni Tallman 26 digs, 33 perfect passes. Spartan Volleyball defeated Kittitas 3-0 (25-15, 25-11, 25-6) at home on Thursday, September 6th. Lily Stewart had 12 kills and 2 blocks, Kaitlyn Roettger was 12-12 serving with 4 aces, and Nizhoni Tallman had 24 digs and 10 perfect passes. Highlights: Delilah Schneider 7 kills, 7 perfect passes; Isamar Solorio 10-10 serving, 6 digs; Kaitlyn Roettger 12-12 serving, 4 aces, 6 digs; Lily Stewart 12 kills, 2 blocks; Naya Roettger 13-13 serving, 24 assists, 9 digs; Nizhoni Tallman 24 digs, 10 perfect passes.